Join our Citizen Science team! For this project, citizen scientists conduct breeding season point count surveys at 12 sites around Salt Lake to inform conservation and management. We have roles for everyone from experienced birders to complete beginners! Indoor training is at the end of February, and field trainings start in March. Surveys are conducted April-July. Now recruiting new participants! Email cooperf@tracyaviary.org and fill out a volunteer application today! 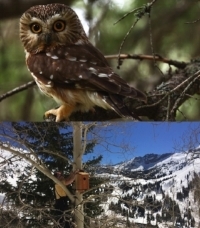 A team of citizen scientists helps with weekly nest box checks for 20 songbird and 20 owl boxes placed in different habitat types around Alta Ski Area. We snowshoe, ski, or hike out to nest boxes and use cameras on extension poles to check for owl and songbird chicks. Nest checks go from March through July. Now recruiting new participants! Fill out a volunteer application by February 28! 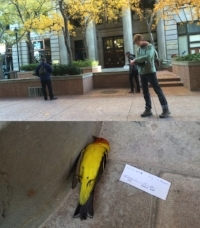 During spring and fall migration (April-May and September-October), our SLACS team goes on early morning surveys in downtown Salt Lake City looking for birds that have collided with buildings overnight. This study helps us better understand the impact of light pollution on birds, and is guiding a 'Lights Out Salt Lake' initiative in 2018. Find out more about SLACS here. Project Broadtail is a citizen science project that help us better understand the Broad-tailed Hummingbird, a bird of conservation concern that is common but declining in the state of Utah. 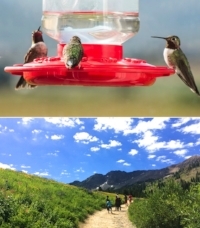 Participants document hummingbird locations around their home and in recreation areas for the season that they are in Utah - approximately April through September. Learn more about Project Broadtail here. Our citizen science team surveys our study sites year-round to better understand how birds use habitat throughout their entire life cycle. Join our trained survey leader on non-breeding surveys where participants walk through the site as a group to count birds. No previous bird ID skills required. View a schedule and sign up here. Email cooperf@tracyaviary.org for more information about current projects and opportunities.